Have you ever wanted to learn to play African drums? It’s a fun way to energize yourself through learning music. 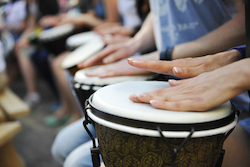 African drumming has proven health benefits, and is easy for anyone to learn at any age.